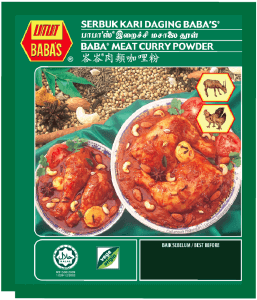 The Babas Meat Curry Powder is Skinnymixer’s Curry Powder of choice. The aromatic red curry powder is gluten free and not full of fillers like many curry powders. You may see it in the earlier recipes as ‘Malaysian Meat Curry Powder’. This curry powder can be found in most Indian or Asian Supermarkets. There is also a spicy variety with a big red border around the packet. The Skinnymixers Community has compiled a ‘Where to Buy Babas’ Map over the last few years. If you are travelling to reach the shop, we recommend calling ahead first to make sure the listing is still current. Hopefully it will help you find your local supplier 🙂 click here to view it. Or you can buy online from grandmaspantry.skinnymixers.com use the discount code SKMIX for 10% off. If you are substituting please consider that other curry powders will not have the same flavour or strength, so be careful not to add too much! If you wanted to try and make your own substitute, you may want to try the recipe from The 4 Blades. Be careful with the concentration and start with 1 tsp. Why use it? – With so many different curry powders on the market the consistency would vary greatly across different recipes. Some are too hot, different flavour profiles etc. the Babas is the one Nik recommends as it doesn’t have any nasties in it and the depth of flavour that it has. If you make your own it won’t be the same as the babas. It’s what will produce the best results for you. Can I use Keens? – Keens isnt a comparable curry mix it doesnt contain the asian flavours. Remember to reduce the quantity if you do use Keens. WHAT DO I USE IT IN?